Are studio apartments a good investment in NYC? And can you find one in a building with decent amenities for $350k? Guest broker Amy Axelrod of Citi Habitats delves into the details in this week’s Buy Curious. With a limited budget such as yours, it’s going to be imperative that you prioritize what’s important to you in terms of location, size, views, light, condition of apartment, building amenities, etc. as you will not be able to get it all. It would be smart to make a needs vs. wants list as one of your first steps in the process. It would also be helpful for your broker to get a good understanding as to why you are purchasing—is it more for lifestyle or investment potential? Asking yourself these important questions and relaying the information to your broker is vital, as it gives us the tools we need as we begin to sift through listings. Whether you're buying an apartment in Manhattan or Brooklyn, it is important to understand the advantages and disadvantages of co-ops versus condos. The knowledge will help you determine which goals of yours are achievable. The advantages to buying a condo are that they have way more flexibility with subletting, less stringent financial requirements and historically have appreciated at a much faster pace than co-op properties. This is in large part due to the aforementioned reasons, but it’s also because there is a much larger supply of co-ops on the market. Typically, they make up over 75% of the available inventory. The major advantage of course in purchasing a co-op is that you get a lot more bang for your buck. If you decide you want to live in Manhattan, you will be able to find a studio in a doorman building, but you will most likely find only co-ops at the $350k price point. The median price that co-op studios sold for in Manhattan during the third quarter of 2013 was $444,000 which means you might have to make some sacrifices in order to make your budget work. For example, if location is important to you, then you will probably have to sacrifice some square footage and/or condition of the apartment. If a larger living space is your top priority then you may be further from the subway or on the outskirts of your desired neighborhood. In Brooklyn, you can find both co-ops and condos that are listed around $350k. Your options will be broadened if you are willing to forego the doorman, as there is a lot of non-doorman inventory in the borough. You may even be able to find a 1-bedroom or 2-bedroom in an up-and-coming neighborhood. In the long term you may see a greater return on your investment here, and depending on what neighborhood you choose to explore, you may find considerably more space than you would ever be able to afford in Manhattan. Regarding your question of whether it is better to buy a 1-bedroom in a less popular neighborhood versus a studio, I would say that 1-bedroom units have appreciated more over time than studios, but this is not to say studios don’t appreciate over time too. In the right location with the right views studios can potentially appreciate more than larger apartments. Upper East Side studio/1-bathroom co-op, $337,000: This studio at 75 East End Ave. between E. 82nd and E. 83rd Streets has everything you’re looking for. It’s located in a co-op doorman building with a gym, and the apartment itself is approximately 550 square feet, which is large at this price point. 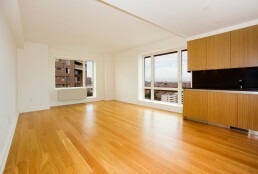 It also features stainless steel appliances and is located on a high floor. The building is located a little far from the subway right now, but with the new Second Avenue subway coming, it may be a good investment. 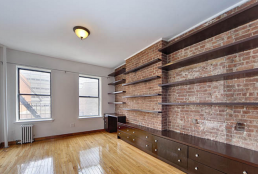 Gramercy Park studio/1-bathroom co-op, $334,000: Priced at $334,000, this co-op studio at 330 Third Ave. between E. 24th and E. 25th Streets may seem like a good deal, but it’s on a low floor, which means there is a good chance it doesn’t get great light. Also, it is not renovated and needs some TLC, which can lead to additional costs. Greenwich Village studio/1-bedroom co-op, $350,000: Located at 24 Fifth Ave. between West 9th and 10th Streets, this co-op studio is definitely in a prime location. 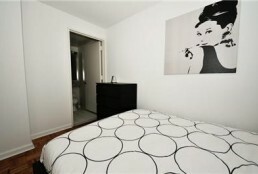 It’s right at your budget of $350k , is located on a high floor so noise won’t be an issue, and it has a 24-hour doorman. However with only one window, it may not get a lot of light. This is a good apartment for you if location is your top priority. Bay Ridge 1-bedroom/1-bathroom co-op, $274,000: This 1-bedroom Bay Ridge co-op at 149 Marine Ave. between 96th and 97th Sts. offers approximately 800 square feet, new hardwood floors, stainless steel appliances, granite countertops, and a king-sized bedroom. There is no doorman, but the building does have an elevator, plus the apartment is priced well below your budget, and it’s a sponsor unit meaning the approval process will be fast. The downside is that while Bay Ridge is a great neighborhood, it’s a long trek to Manhattan. Bed-Stuy studio/2-bathrooms condo, $399,000: This duplex condo at 802 DeKalb Ave. between Throop and Tompkins in Bed-Stuy is slightly above your budget, but offers the flexibility of a condo, approximately 742 interior square feet, washer/dryer hookups, a balcony, and an open kitchen with stainless steel appliances. It’s also only 5 blocks to the G train and walking distance to the J, M and Z trains. This new construction project could be a good investment. Also, the low monthly costs (maintenance is $229/month and taxes are $34/month) make it very attractive. Take It or Leave It: Would you pay $2,900/month for this Upper East Side studio?